The 26th PORCELANOSA Grupo International Exhibition from January 21 to 25, is the meeting point for professionals and followers of the architecture and design sector from around the world. KRIONTM will take advantage of this event to launch incredible innovations in its showrooms, among which its new tones clearly stand out. In all, there are 13 new colours added to the wide colour range in which this innovative material is available. The LUXURY series will now include 2 new tones: Etna and Mesina. The first recalls the texture of marble, due to its dark tone with uneven white lines. Mesina uses grey instead, with a texture similar to cement. LUXURY also offers another great innovation, and it is the availability of several sheet sizes with the new 6mm sizes. Lightness, thermoformability and technology in the new KRION sheets. ART VEINS will showcase its elegant tones: Bianca Opera, Noce Atrio and Nero Palazzo. The three colours share a very similar aesthetic, because of their fine and subtle lines that revitilise the surface, and their uniform bottom with small particles. It should be noted that their colours are totally different from each other, but the 3 follow the same elegant and modern pattern. The Crystal Grey colour is incorporated into the ROYAL SERIES by KRIONTM, which is capable of bringing naturalness to spaces because of the uniform specks in grey tones in different sizes, reminiscent of a stony texture. The firm’s catalogue is extended with the new MATERIA series. This is based on nature and its respect for the environment, thanks to its recycled material composition. It is made up of 3 colours: Amaro, Grigio and Luce with greyish and whitish tones. The vibrant colours designed by KRION™ for this season will be the 4 innovative contributions for the BESPOKE series: PINK PILLOW, SAGE, TEAL BLUE and CORAL. 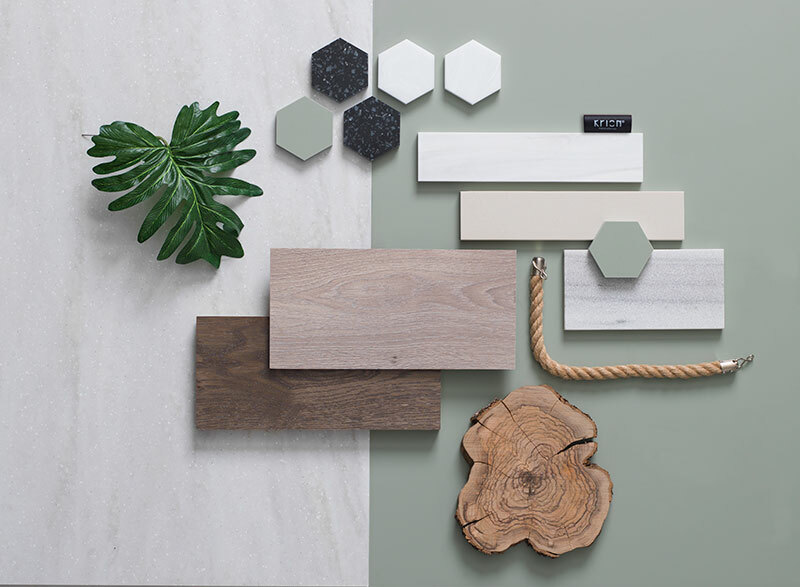 Modern and daring tones, for spaces that want to unleash creativity. The showrooms that KRIONTM will showcase its designs from during the exhibition will be full of new and extraordinary ideas at aesthetic level, which combine perfectly with the functional properties and the incredible benefits of this material.